above Las Olas Beach located in "Punta del Este" in Maldonado, Uruguay. These rare long clouds may form near advancing cold fronts. In particular, a downdraft from an advancing storm front can cause moist warm air to rise, cool below its dew point, and so form a cloud. Roll clouds may actually have air circulating along the long horizontal axis of the cloud. A roll cloud is not thought to be able to morph into a tornado. 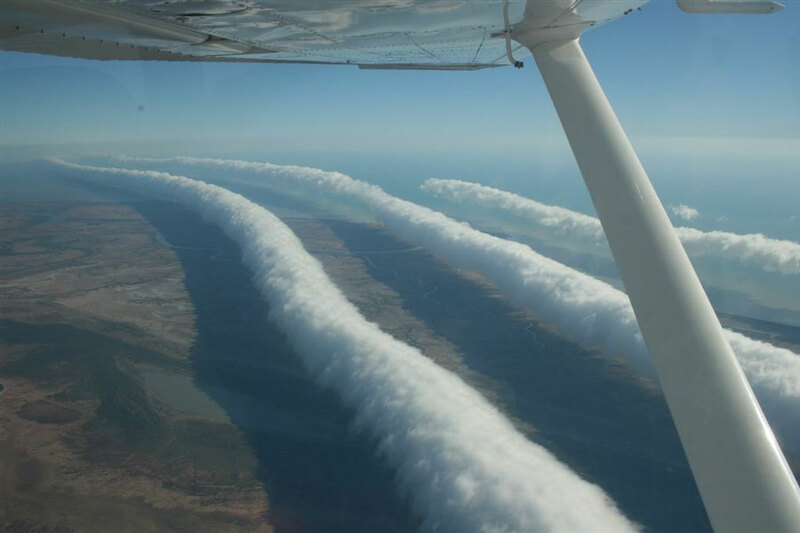 Unlike a similar shelf cloud, a roll cloud, a type of Arcus cloud, is completely detached from their parent cumulonimbus cloud. Syd Fischer is not the only 83-year-old with a stake in a yacht in the Rolex Sydney Hobart race this year. Bob Oatley, the wealthy octogenarian winemaker, remains owner of Wild Oats XI, the maxi that has won line honors four times. But Fischer is certainly the only 83-year-old who will be sailing on his (or any) yacht during the potentially wild ride to Hobart starting Sunday. Although he is not the oldest man to sail in the race — John Walker was 86 when he took part in 2008 — this will be Fischer’s 42nd appearance in one of the world’s premier ocean races, and, through the decades and the occasional disaster, he has become a symbol of Australian sailing and perseverance. “As I always say, it’s something to do between Christmas and New Year,” Fischer said by telephone this week from Sydney. For Fischer, this is a rhetorical question. For others his age, it is — quite reasonably — not. Fischer, a Sydney property developer, has been pushing himself and his crews in the race the Australians call “the Hobart” for nearly 50 years. Asked to recall his first one, he could not remember whether it was in 1962 or 1963. (It was 1962.) But he could certainly recall what happened one morning in that race as they were sailing down the Tasmanian coast through the fog in the yacht Malohi after the previous owner, who was on board, had tried unsuccessfully to convince the navigator that they were sailing into a dangerous area called the Hippolyte Rocks. And out of the mist came the bloody great rocks sticking out of the water. Fischer is chuckling, but he knows too well that not all Sydney-Hobart stories have happy endings. In 1998, a severe storm caused the death of six sailors, among them Jim Lawler, a friend of Fischer. Fischer, Ellis and their crew — which included a future America’s Cup helmsman, James Spithill — escaped harm. Fischer’s yacht finished third that year and he says now that he never considered calling it a career. Fischer fell for sailing when he discovered that it put him in contact with the same big waves and tough-minded, team-minded competitors that were part of the Australian surf-lifesaving events in which he excelled as a Sydney teenager. After racing in Malohi, Fischer had his own yacht built in the 1960s. He settled on the name Ragamuffin, in honor of some Australian women who formed a hospital-volunteer committee called Ragamuffin that sometimes used one of Fischer’s penthouses for meetings and other functions. He still calls his yachts Ragamuffin even though his current carbon-fiber TP-52 bears little resemblance to the timber original. Fischer won Sydney-Hobart line honors in 1988 and 1990 and won the overall handicap in 1992. He also won the 1971 Fastnet race, has sailed in eight Admiral’s Cups and mounted five America’s Cup challenger campaigns, most recently in 2000. “In Australia you can’t raise money for the America’s Cup, because when Alan Bond won and then went broke and a lot of small people lost their money in his company, I think it turned sponsors off,” Fischer said, referring to the Australian businessman who won the Cup in 1983. He has not retired, however, and continues to go to the office in Sydney on weekday mornings, awaiting a better business climate and maintaining his physical condition with the help of a personal trainer. But Fischer has no illusions about his longevity as he heads back out to sea on a slippery deck while others in his peer group, like Oatley, watch from shore or the spectator fleet. The first of the ships sailing on the Malaspina 2010 expedition, the Hespérides, will set out from Cádiz on Tuesday 15th November. The expedition is a multidisciplinary project led by the Spanish National Research Council (CSIC) which aims to gauge the impact of global change on the ocean and study its biodiversity. The send off, which will take place at 11 a.m. on the east quay of the Port of Cádiz, will be attended by the Minister for Science and Innovation, Cristina Garmendia, and the Minister of Defence, Carme Chacón. The event will also be attended by the president of the CSIC, CSIC, Rafael Rodrigo, the project coordinator and CSIC researcher, Carlos Duarte, the captain of the Hespérides, Juan Antonio Aguilar, and the president of the Fundación Banco Bilbao Vizcaya Argentaria, Francisco González. "This expedition will not only circumnavigate the globe, but also breathe new life into Spanish oceanography by combining efforts and generating a new culture of cooperation." It is an ambitious project on a global scale, which aims to meet two important needs: to assess the impact of global change on the ocean and explore the as yet unknown ecosystem of the deep ocean," Duarte highlighted. The Hespérides will be joined in January next year by the Sarmiento de Gamboa. Together they will spend a cumulative total of around 9 months at sea and cover some 33,000 nautical miles (one nautical mile is equal to just over 1.8 kilometres). The lion's share of this distance will be covered by the Hespérides, which will sail a route from Cádiz, taking in Río de Janeiro, Cape Town, Perth, Sidney, Auckland, Honolulu, Panamá and Cartagena de Indias, ending next July in Cartagena (Spain). For its part, the Sarmiento de Gamboa will cross the Atlantic from Las Palmas de Gran Canaria to Santo Domingo. During their stopovers in port, the two ships will be running a series of lectures and other events to raise awareness about the effects of global change, highlight the importance of marine research, and describe the Malaspina expedition. In total, over 250 researchers from 19 Spanish institutions will be taking part in the project. This figure rises to almost 400 if we include the students and researchers at the 16 associated foreign institutions, which include the NASA, the European Space Agency, and the Universities of California, Río de Janeiro, Washington and Vienna. The expedition is being run as a project under the Consolider-Ingenio 2010 programme, which is funded by the Ministry of Science and Innovation. It involves 27 research groups from the CSIC, the Instituto Español de Oceanografía, 16 Spanish universities, a museum, a public research foundation and the Spanish Navy. The funding, which is being provided by the CSIC, the Spanish Navy and the Fundación BBVA, along with a number of Spanish universities and regional governments, comes to a total of around 6 million euros. The scientific goal of the expedition is to conduct a multidisciplinary study evaluating the impact of global change and exploring the biodiversity of the deep ocean. This will involve measuring temperature, salinity and nutrient concentration in the various different ocean regions, studying the exchange of gases between the ocean and the atmosphere, and determining the fate of CO2 absorbed by the sea, and the influence of chemical substances on the ocean and their possible toxicity. The expedition will also explore the diversity and metabolism of phytoplankton and zooplankton and the micro-organisms of the sea's depths. The team will perform tests at 350 points and collect over 70,000 samples of air, water and plankton everywhere from the surface down to depths of 5,000 metres. One of the milestones of the project is the launch of 19 Argo buoys which will measure the ocean's temperature and salinity, in 10-day cycles, from the surface down to a depth of 2000 metres, many of them in zones that have never been monitored. A further 20 buoys will be launched, designed specifically for the project, which will measure the salinity at a depth of 50 centimetres and send the data via the SMOS satellite. This will enable the first satellite map of marine salinity to be charted, through a collaboration between the Malaspina project and the European Space Agency. The project also involved the design and patenting of an innovative new oceanographic sample bottle that enables marine plankton samples to be taken at depths of down to 4,000 metres. The bottle can be fitted in the usual CTD or frame structure in which oceanographic sample bottles are held. The samples taken will go to make up the Malaspina 2010 Collection, which will also include information and images describing the progress of the expedition. A set of samples will be sealed and stored for several decades as a time capsule awaiting new scientific developments and so as to bequeath future generations an extensive collection of material for research and for use in developing new techniques. The project also aims to stimulate marine sciences in Spain and to encourage young people to take up a career in science. Indeed, over 50 young people will be completing their postgraduate studies, embarking on a section of the survey in order to collect information for their masters' dissertation or doctoral thesis through the Programa de Doctorado Expedición Malaspina Fundación BBVA-CSIC programme, jointly funded by the two institutions. The expedition, of which the full name is Expedición de Circunnavegación Malaspina 2010: Cambio Global y Exploración de la Biodiversidad del Océano Global (Malaspina Circumnavegation Expedition 2010: Global Change and Exploration of the Biodiversity of the World's Oceans) has been named after the sailor Alejandro Malaspina (Mulazzo, 1754 – Pontremoli, 1810), a frigate captain in the Spanish Navy, who died 200 years ago this year. In July 1789, Malaspina led the frigates the Descubierta and the Atrevida on the first Spanish circumnavigation expedition. During the voyage, which lasted five years, researchers collected data, charted territories, recorded fauna and explored the sea. After the expedition Malaspina was promoted, but later accused of conspiracy, and finally imprisoned and then exiled, resulting in his expedition's being forgotten until the late 20th century. The project being led by the CSIC aims, 200 years after the explorer's death, to restore to Malaspina's pioneering expedition the prominence it deserves. 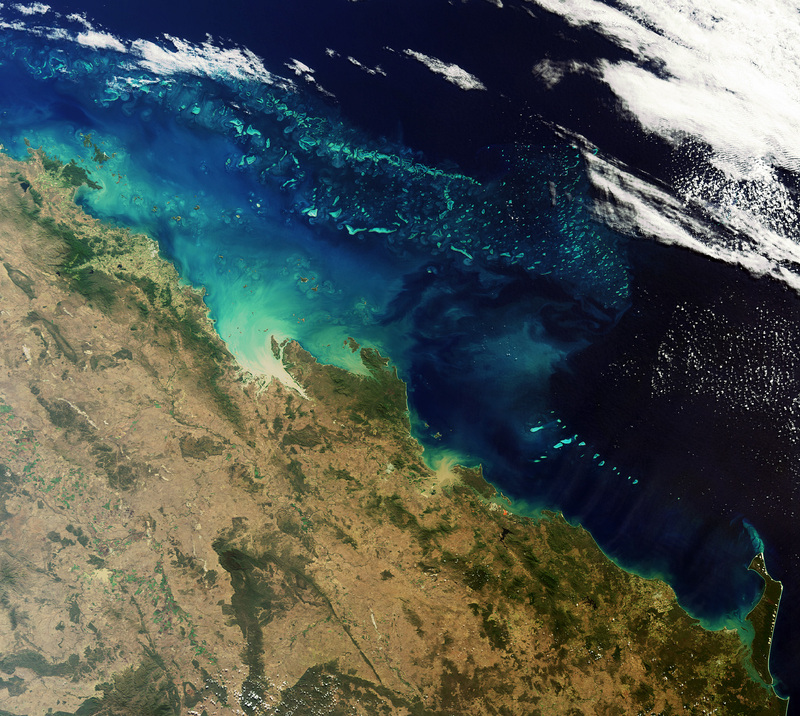 The great sweep of water around Planet Earth has been captured from space in greater detail than ever before. 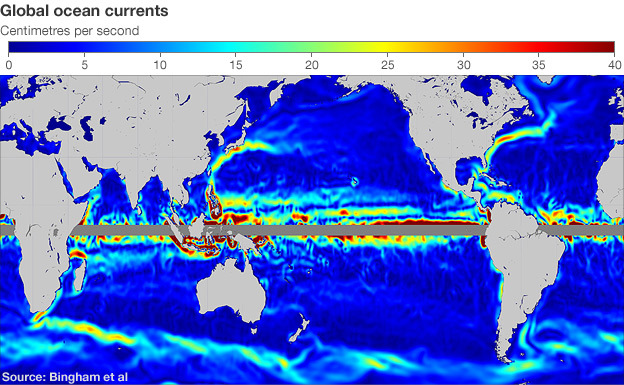 New observations from Europe's Goce gravity mapping satellite have allowed scientists to plot ocean currents with unprecedented precision. Understanding gravity is fundamental to being able to track the direction and speed of water across the globe. The data should improve the climate models which need to represent better how oceans move heat around the planet. Very strongly represented in the new map is the famous Gulf Stream, the most intense of all the currents where water zips along at velocities greater than one metre per second in places. "The Gulf Stream takes warm water from the tropics and transports it to higher latitudes, and that warmth is released to the atmosphere and keeps the British Isles, for instance, much warmer than they would otherwise be," said Dr Rory Bingham from Newcastle University, UK. "When this water has reached higher latitudes, still, because it is by then cold, salty and dense, it will sink; and you get this overturning circulation that helps regulate Earth's climate," he told BBC News. Dr Bingham presented his ocean circulation data using the latest information from Goce at the recent American Geophysical Union (AGU) Fall Meeting, the largest annual gathering of Earth and planetary scientists. The European Space Agency (Esa) satellite was launched in March 2009, and is delivering a step change in our vision of how gravity varies across the globe. Contrary to popular perception, the pull of gravity is not the same everywhere. There are actually very subtle differences in the tug exerted by the mass of the planet from one place to the next. In the oceans, this has the effect of making water bulge over great submarine mountain ranges and to dip over the deepest ocean trenches. Goce, which circles the Earth from pole to pole, carries a state of the art gradiometer to sense the variations on a scale better than 100km. The information is critical to oceanographers attempting to trace the currents. If they compare the gravity information with measurements of sea surface height made by other spacecraft, they can establish a much better picture of where water is piled up and where it is likely to flow and at what speed. Very accurate data on currents is already obtained from drifting sensors thrown into the water, but these are necessarily just point measurements. Oceanographers would hope therefore to combine the truly global perspective they can only get from Goce and other satellites with the "ground truth" they can retrieve from drifters. Add in further data collected about sea temperature and it becomes possible to calculate the amount of energy the oceans are moving around Earth's climate system. Computer models that try to forecast future climate behaviour have to incorporate these details if they are to improve their simulation performance. "The new information coming from Goce is amazing," said Dr Bingham. "We're getting down to very fine scales now. It's incredible to think for example that we can sense from space very small circulation features like the Mann Eddy, a persistent pocket of water in the Atlantic that just goes around and around." The ocean circulation information presented at AGU was built using just two months of Goce gravity data. Scientists expect to construct improved maps when they understand better how the satellite's sophisticated instrument behaves and the observations accumulate. Goce is not expected to be a long-lived mission. Flying at an altitude of just 255km - the lowest orbit of any research satellite in operation today - it experiences significant drag from the atmosphere. This has to be counteracted by constantly throttling an ion thruster on the back of the satellite. When the fuel for the thruster runs out, however, Goce will fall from the sky. "We have the funding and resources on board to go until at least the end of 2012," said Dr Rune Floberghagen, Esa's Goce mission manager. If European governments then provide additional money and Goce can be frugal with its fuel reserves, the end date could move out to 2014. Goce is an acronym for Gravity field and steady-state Ocean Circulation Explorer. It is part of a series of missions that aim to do innovative science in obtaining data on issues of pressing environmental concern. Celebs & sailors shout out! The Extreme Sailing Series™ is set to expand as OC Events, creator of the award-winning circuit now in its 4th season, confirm a worldwide 2011 series. The expansion is part of a new five-year vision for the professional sailing circuit that has changed the way sailing is seen, becoming one of the hottest properties in the sport. OC has also concluded this week the acquisition of the Extreme 40 Class, including the design and build rights from TornadoSport. TornadoSport, headed up by CEO Herbert Dercksen, created the game-changing concept in 2005 along with Mitch Booth and Daniel Koene when they launched the Extreme 40 catamaran that was designed by Yves Loday and built today by Marstrom Composites in Sweden. The acquisition will include management of the Class, technical support for the teams, and boat sales. As previously announced, the Extreme Sailing Series™ is committed to the Extreme 40 as the main act until at least January 2013, and will seek the input of current teams with regards to possible evolutions of the boat and rules for the 2011 season. The Extreme Sailing Series™, one of just four circuits with ISAF’s (International Sailing Federation) Special Event Status, is renowned for delivering top class professional racing that uniquely attracts the world’s best sailors from a range of disciplines (America’s Cup, Olympics and ocean racing skippers), racing in many different formats, with a public focused act staged in a ‘stadium’ format. The 2011 Extreme Sailing Series™ will see an eight event global circuit across Europe, the USA, the Far East and the GCC region. After being approached by more than 60 host venues from around the world in the past six months, there is a current shortlist of 18 for the 2011 circuit, with 2012 discussions also well progressed. The 2010 host venues of Trapani (Italy) and Andalucia (Spain) are already confirmed as part of their multi-year contracts, and OC Events will announce the other venues during October and November. A ‘typical’ 2011 event will consist of five days of racing, as opposed to three last year. The first two days being ’open water’ courses, where the venue permits, before the action heats up in the close-quarters ‘stadium’ racing over the final three days. “We are looking to expand and improve the Extreme Sailing Series™ on all fronts,” said Mark Turner, Chairman of the newly merged OC ThirdPole outdoor events group that owns the circuit organiser, OC Events. “With multi-format competition at top class venues of different types - city centres, ocean facing, rivers and lakes, top class race management and on-water umpiring, development of the outstanding B2B VIP experience that has been at the heart of the event since the beginning, and a bigger than ever entertainment package for spectators on the water and on shore including our Sailing Rocks™ gigs, the Extreme Sailing Series™ will be going up a level. We have plans in place to expand the TV production and distribution, growing both the news service and the successful worldwide TV series, as well as the online content. With strong demand, and a 11-boat limit in place for 2011, a Preliminary Notice of Race is published today with a pre-entry procedure. Whilst there is an encouraging amount of new team potential, existing teams that have helped grow the circuit will be given priority should the limit be reached. Other evolutions in the rules are expected to ensure that the team budgets remain under tight control, in the value-for-money commercially funded circuit. “We have invested heavily in this event since 2007 with good reason. It offers an exceptional return on investment to all stakeholders, in particular, for the ever-improving quality brands that we already have as team sponsors. We shall be announcing some excellent new partnerships at venue, event and team level in the coming months,” confirmed Turner. so that the earth blocks the sun’s rays from striking the moon. or very closely so, with the Earth in the middle. A total eclipse of the Moon occurs during the early morning hours of December 21, 2010 (for observers in western North America and Hawaii, the eclipse actually begins on the evening of December 20). The entire event is visible from North America, Greenland and Iceland. Western Europe will see the beginning stages of the eclipse before moonset while western Asia will get the later stages after moonrise. During a total lunar eclipse, the Moon's disk can take on a dramatically colorful appearance from bright orange to blood red and more rarely dark brown to very dark gray. One of the great things about lunar eclipses is that they are completely safe to view with the naked eye. No special filters are required to protect your eyes like those used for solar eclipses. You don't even need a telescope to watch the eclipse although a good pair of binoculars will help. An eclipse of the Moon can only take place at Full Moon, and only if the Moon passes through some portion of Earth's shadow. The shadow is actually composed of two cone-shaped parts, one nested inside the other. The outer shadow or penumbra is a zone where Earth blocks some (but not all) of the Sun's rays. In contrast, the inner shadow or umbra is a region where Earth blocks all direct sunlight from reaching the Moon. One is reminded that Christopher Columbus got out of some difficulty with Native Americans when, knowing that a lunar eclipse was coming, threatened to take the moon away. Then only part of the Moon passes through the umbra, a partial eclipse is seen. If the entire Moon passes through the umbral shadow, then a total eclipse of the Moon occurs. It is also possible to have an eclipse where the Moon passes through only the penumbra. Each of these eclipses has a unique and distinct appearance (see Visual Appearance of Lunar Eclipses). For more information on how, what, why, where and when of lunar eclipses, see the special web page Lunar Eclipses for Beginners. It is the world’s most protected marine area, one of its natural wonders and a World Heritage site. Spanning more than 2000 km and covering an area of some 350 000 sq km, it is the largest living structure on Earth and the only one visible from space.